We’ll show you, how to Install Anchor CMS on CentOS 7. Anchor CMS is an open-source, lighter-weight and ultra-simple blogging system.It’s written in PHP and comes with markdown support, custom fields, themes, i18n compatibility and many more. In this tutorial, we gonna show you How to install Anchor CMS on CentOS 7. In this tutorial, we will install the latest version of Anchor CMS on CentOS 7, with MySQL, PHP and Apache. The default PHP version on CentOS 7 is PHP 5.4. In this tutorial, we will install PHP version 7.1. Finally, open your favorite web browser, navigate to http://your-domain.com/ and if you configured everything correctly the Anchor CMS installer should be starting. You should follow the easy instructions on the install screen inserting the necessary information as requested. That is it. The Anchor CMS installation is now complete. 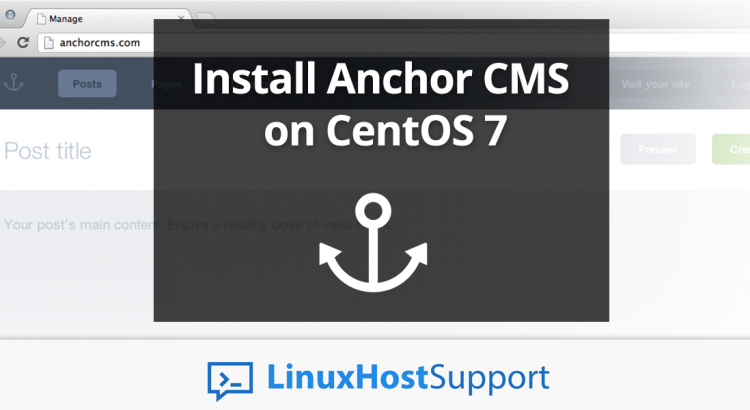 Of course, you don’t have to install Anchor CMS on CentOS 7 if you use one of our Hosting and Server Support services, in which case you can simply ask our expert Linux admins to install Anchor CMS on CentOS 7 for you. They are available 24×7 and will take care of your request immediately.